One of the greatest things about JBF Seattle is that we get to see, meet and serve so many here in our community. We LOVE our community and are excited to be a part of helping so many families save on the things they want and need and also clear up their home of things no longer needed. Its like getting paid to clean your house! We believe in staying in touch! So please join with us by liking us on Facebook. That’s where we will post news pertinent to our event, fun contests, bargain saving ideas we come across and any quick updates that just deserve a shout out! We do not post often, as we know you're busy too, so be sure to look for our info regularly. Interested in becoming a chartity partner with JBF Seattle? Email me at Seattle@jbfsale.com for more information. 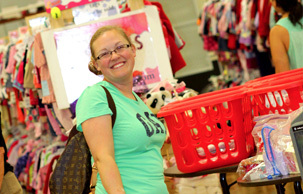 What better way to combine a love of shopping, saving money, making money and going green by recycling gently used items!